A new fast-casual eatery, offering poke and more, has opened for business on the upper level of the Stoneridge Shopping Center. Called Go Fish Poke Bar, the fresh arrival is located at 2433 Stoneridge Mall Road in Pleasanton. The business also has locations in San Jose, Palo Alto, Redwood City and Santa Clara. 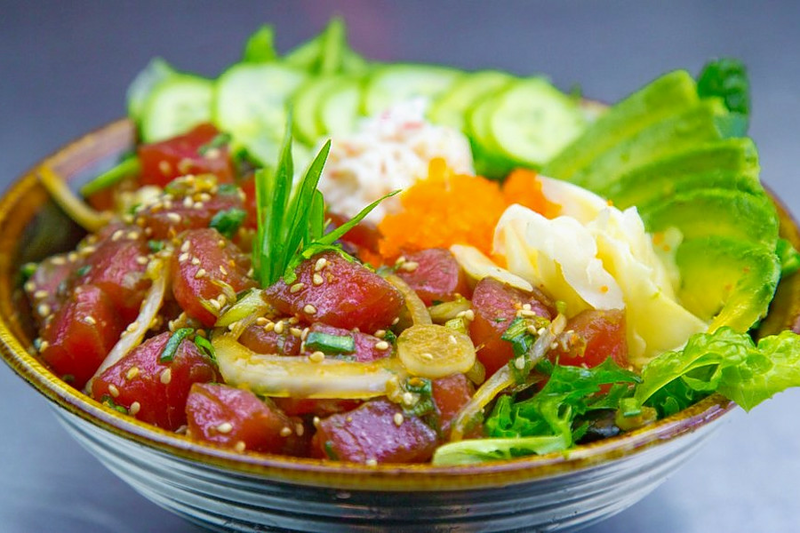 The eatery features a build-your-own poke bar, hand roll bar and weekly specials. Hand roll options include the Bacon of the Sea (crispy miso salmon skin, cucumber and avocado), Negi Hama (yellowtail, cucumber and green onion), among others. Miso short rib, shoyu ginger chicken, seaweed salad and Asian slaw are also on offer. For dessert, try the freshly made mochi ice cream in flavors like guava and tiramisu. Wash down your meal with one of the many drinks, including organic yuzu lemonade, lychee lemonade, mango-orange-guava juice blend, Japanese craft beers and sake. Go Fish Poke Bar has garnered rave reviews thus far, with a 4.5-star rating out of 22 reviews on Yelp. Alan M., who was among the first Yelpers to review the new spot on Sept. 3, wrote, "Love the new bright atmosphere. Fits the fresh food they are selling. Friendly service and a good selection of food and drinks." Yelper Christine L. added, "I really like this place. It is a great option located at the Stoneridge mall, and they have unique drinks like lychee lemonade. I was able to get a free drink with the soft opening and the owner was so sweet and welcoming. I thought my meal was great." Head on over to check it out: Go Fish Poke Bar is open from 11 a.m.-9 p.m. from Monday-Saturday and 11 a.m.-7 p.m. on Sunday.